A statement every publicly-traded company must file with the SEC each quarter indicating all cash inflows and cash outflows from all sources, whether they are business activities or the company's investments. This is considered one indication among many of a company's financial health. A business activity may be reported as income if a company has agreed to a contract, even if no money has actually changed hands; a cash flow statement seeks to avoid this by showing how much cash the company has on hand. It is also called an application of funds statement. Fig. 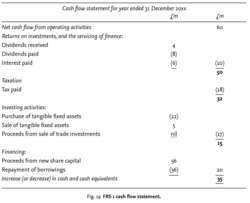 19 FRS 1 cash flow statement. a statement which is included as part of a UK company's published annual report and accounts. The one used in the UK in 2002 is prepared in accordance with the provisions of FRS 1 (Financial Reporting Standard 1) . This shows where the finance came from and where it went out to during the period under review and helps to explain the movements in the cash and bank balances, as illustrated in Fig. 19. See also, FUNDS FLOW ANALYSIS, SOURCES AND USES OF FUNDS STATEMENTS. We had to take all these elements and map them over in our accounting system, so that when we'd go in to prepare the cash flow statement, they'd all kind of fall out in the right spot," McKee said. One of the authors of this paper is a financial advisor to small business owners, who found that GAAP's indirect method cash flow statement may be misleading for small business owners when making important financial decisions. Sound financial decision making for entrepreneurs: can the GAAP cash flow statement mislead? But I feel that, while they aid people's understanding of financial accounting, using T-accounts as workings for a cash flow statement may be a waste of precious time, so it's probably helpful to get accustomed to making a columnar presentation of workings in all contexts. Warning signs were readily apparent to the few investors who regularly analyzed changes in the companies' quarterly cash flow statements. Auditors have little to work with, however; only SFAS 95, Statement of Cash Flows, specifically addresses the cash flow statement, and only 15 paragraphs within SFAS 95 discuss the appropriate categorization of cash expenditures within the cash flow statement. The cash flow statement breaks annual revenue into anticipated monthly receipts--small amounts during inactive periods, larger amounts during active periods. To their credit, today both Lucent and Nortel each issue a full income statement, balance sheet and cash flow statement in their quarterly earnings releases. In the era of Regulation G, I agree with Hugo Nurnberg ("Income Taxes in the Cash Flow Statement," June 2003) that the potential benefits of additional cash flow information would be very useful to investors and others, and would likely exceed the costs of preparing it. Even for the most complex models, White Birch says, Projected Financials delivers an accurate set of financials--income statement, balance sheet, and cash flow statement. By allocating income taxes in the cash flow statement, the income tax effects of transactions and events would be reported in the same section of the cash flow statement as the transactions and events themselves, resulting in a more precise presentation of the net cash flows from operating, investing, and financing activities.